This is an ode to the greatness of the Garmin Forerunner 305 and why it made my day. Look at that composition - the running shoe carefully placed alongside the Garmin. I clearly paid attention in Art History classes. And look where it got me. Please note that I ran farther in less time than my run on Tuesday! More specifically... I ran 0.07 of a mile farther in 46 seconds less time. Okay, so I'm not winning the IronMan or challenging Caroline Kilel to a competition anytime soon, but even the little victories count, right? Right? No, the victory is not that I somehow managed to take an even more awkward self portrait than usual. See that backwards number in the top left corner of the Garmin? When you're not looking at it through Photo Booth and next to my crazy eyes, it says 07:52. And that, my friends, was the best pace of my run today. Read it again: 7:52. That's a sub-8-minute-mile, kids! 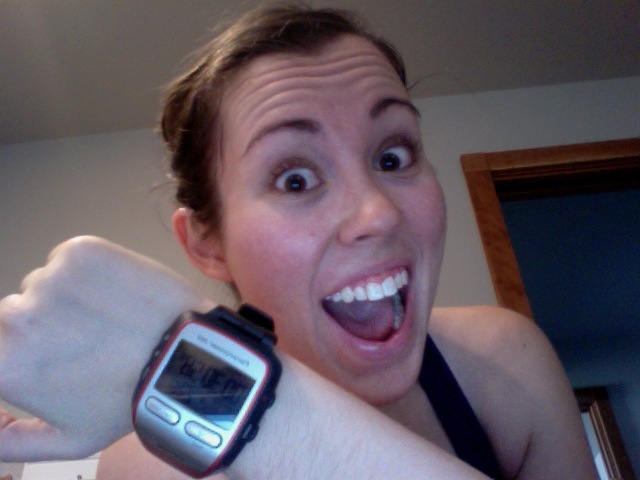 Now, my logical mind scoffs and says that the Garmin is adorable, but faulty, and that must be inaccurate. But even if I was running at that pace for just a second or two, seeing that number gives me such hope! 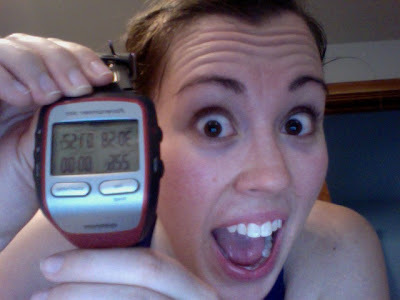 This is big news - I could someday run an 8 minute mile! Of course, it would be just one mile, and they'd have to scrape me off the pavement and onto a stretcher at the end of that mile... but I could do it! In related news... I am seriously considering registering for the Georgetown to Idaho Springs Half Marathon as my very first. The only serious problem is that the race is August 13th, which means if I finish out all 9 weeks of Couch to 5K, I only have 9 more weeks to get from running about 3 miles at a time to being able to run 13.1 miles. And the training plan I was going to use (Hal Higdon's Novice Plan) requires 12 weeks. So I will have to think on it. But from what I understand it is a gorgeous and fast race... I could go for fast for my first half!